That the sound of progress. A slow, nearly silent drip in a dark room with no other sound. But it’s progress. It’s t-minus three weeks (ish) until Christmas, and time for my son and I to get our game on if we’re going to be giving any handmade presents this year. I have really only two presents I plan to make, but one of them depends on getting the chevy finished. My boy, on the other hand, has eight people he needs to have gifts for. So we jumped in the truck and headed to Watsonville to see what Jackel Enterprises had on sale. A lot as it turns out. All of the wood in the racks is discounted 25%, and the Claro walnut is 50% off. It took a lot of self restraint not to grab a bunch of the 8/4 Cherry with the idea of making the Frank Lloyd Wright table I just developed plans for. But we did get some Claro and some Maple for a present Cole is going to make a chess set on the scroll saw. I found some plans online, and I helped him get started on it this afternoon. He’s never “scrolled” before, and I think he’s doing a really great job. He’ll be an expert by the time he’s done. Three pawns. We need to pick up the pace, because if we only get three pieces done each day we’ll never make Christmas! Meanwhile, I made the lever-arm-thingie for the Chevy. It’s a simple piece and it was fun to play with the spokeshave and scraper shave again. 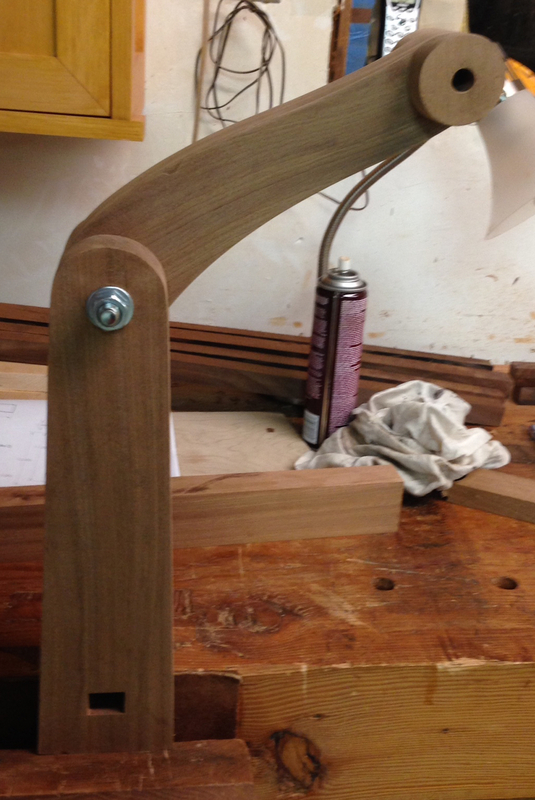 With this piece done I’m down to the vise clamp and the foot pedal — those should both be quick pieces. Wow, somebody is getting a very special chess set for Christmas! Something that will be treasured I’m sure. He’s doing a fantastic job. I feel your frustration. Sometimes the planets align and projects seem to almost finish themselves. Not very often, but sometimes. Most times progress comes in spits and spurts though. It looks like your on the home stretch. Still three weeks isn’t all that long considering that this chevy will last generations. I’m happy with the part I made, and it went smoothly – maybe 45 minutes from rough stock to finished part – but that was all the time I had. I hope to get a bigger block of time in the shop today. I’m guessing an hour each for the two remaining parts, and then I can glue up the seat assembly and put a coat of finish on the rest of the stuff. Cool lever arm thingie…..I worked for a pipe organ builder where we made all sorts of lever arm thingies to open gates, couple pipes, etc., etc. Simple machines are fun to make with wood. Thanks! I tried to get the swirl in the grain aligned with the shape, but I doubt anyone will notice. What’s important is function, and this should be solid in that sense. No slop and its plenty strong. A lot of muss and fuss to cut out a bit of marquetry, right? 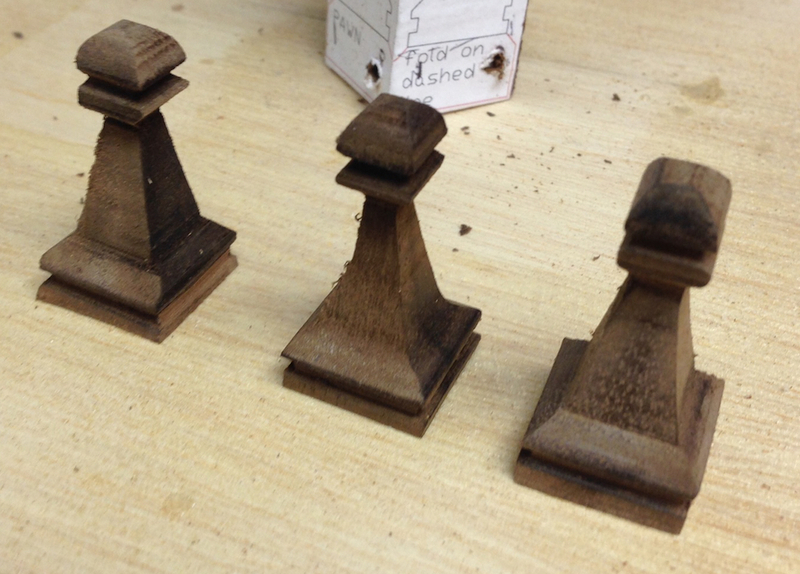 Now that’s a clever way to make chess pieces. It looks like he’s doing a great job. Sounds like its crunch time. Maybe you can sneak some time off to get it all done. Marilyn, I like the way you think. Time off sounds like a great idea! I found the patterns for the chess set online, there are large and small versions (we’re using the small version, printed at 90% so they fit on the wood we have). 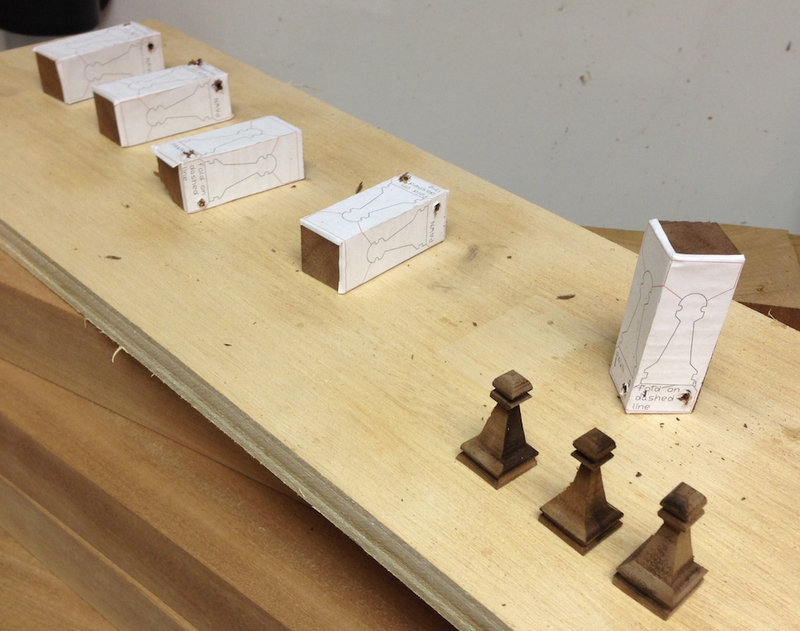 He’s got all eight dark pawns done, and he’s better at the scroll saw than I am. I’m so jealous of how quickly kids can learn new skills! What was even more fun was going on a detour to look at all of the weird and wacky way people have made chess pieces. There are several variations on the scroll saw approach, some turned, some welded up from nuts and bolts, and even one set carved as tiki faces. I love it! Eww! Thanks for the link. Can’t wait see how this turns out.